The Polyflow® Drainage family of products were designed and introduced by Polyguard Architectural Products to provide our customers a variety of solutions to lightweight drainage and at the same time be compatible with our engineered sheet and liquid membrane products. These products are lightweight, have high capacity, can decrease excavation needs and are easy to install. We offer 11,000, 15,000 and 21,000 psf products. Some of our products are to be installed vertically, some horizontally. Some products come with a high-strength Polymeric film on one side and some without. Whether it is called “Drainage Board”, “Dimple Board”, or “Drainage Panel” we have below grade drainage products to compliment your waterproofing system. For high volume, applications see our Polyguard Total Flow product and accessories. Polyflow® 10P has an additional built-in polymeric film to help protect your waterproofing and drainage layer. Polyflow® 15 Drainage Mat is a two-part prefabricated geocomposite drain consisting of a formed polypropylene core covered on one side with polypropylene filter fabric. The fabric allows water to pass into the drain core while restricting the movement of soil particles which might clog the core. The core allows the water to flow to designated drainage exits. Polyflow® 15 is designed for vertical applications. Polyflow® 15P has an additional built-in polymeric film to help protect your waterproofing and drainage layer. Polyflow® 18 is specifically designed to handle the toughest of conditions. The 21,000 psf compressive strength allows this product to stand up to the stresses of a horizontal application. 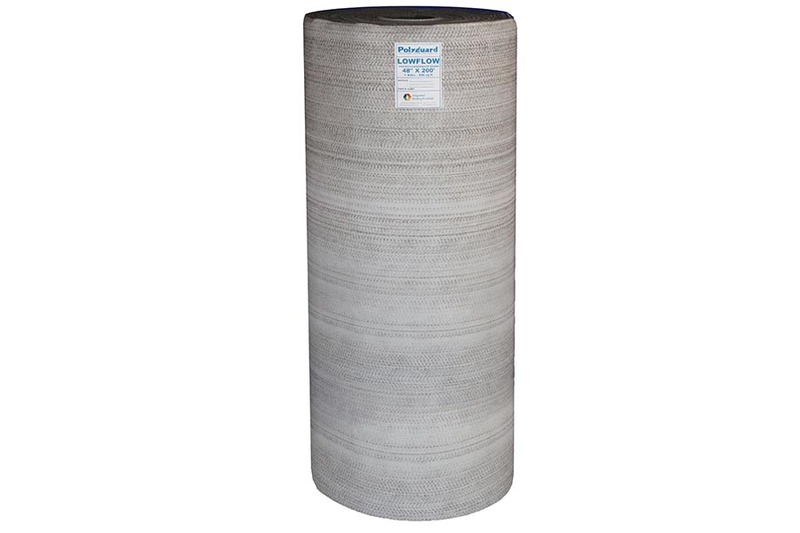 This product utilizes a woven filter fabric which is designed for concrete pours and has the strength to allow flow under loaded conditions. Totalflow™ is a combination of our Polyguard sheet drain products with our unique Totalflow product. In the Totalflow™ system, the sheet drain performs its normal function of water collection, while the Totalflow™ section provides both water collection and a high-profile section allowing for high-capacity water flow to designated drainage exits. Works well with Polyflow Sheet Dain Products. Lowflow™ Protection and Drainage System is a high-strength, multi-layer fabric composite, designed to protect underlying waterproofing membranes and provide a low-cost drainage mat which is suitable for most clay soil conditions.